Luca Carlevarijs – The Metropolitan Museum of Art 1975.1.90. 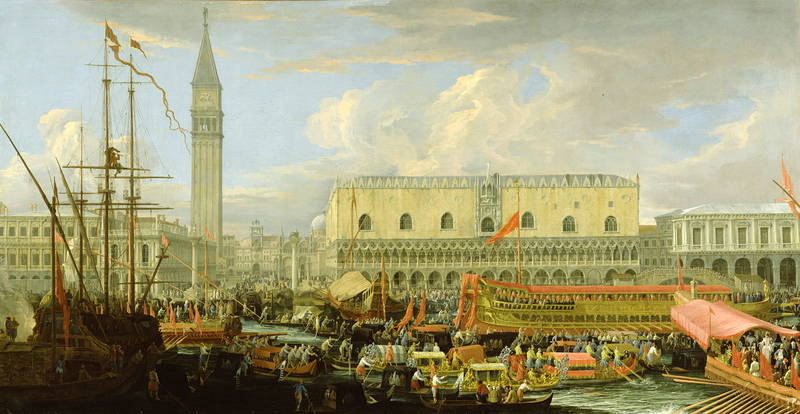 Title: The Molo, Venice, Looking West. Date: c. 1709. Materials: oil on canvas. Dimensions: 50.5 x 119.7 cm. Nr. : 1975.1.90. Source: http://images.metmuseum.org/CRDImages/rl/original/DT3064.jpg/. I have changed the contrast of the original photo. Materials: oil on canvas. Dimensions: 134.8 x 259.4 cm. Inscriptions: LC MDCC X (bottom right on boat). Nr. : 86.PA.600. Source: http://media.gotraffic.net/images/irGoJnXgxgg8/v9/-1x-1.jpg. I have changed the contrast of the original photo. Materials: oil on canvas. Dimensions: 50.5 x 120 cm. Nr. : 1975.1.89. Source: images.metmuseum.org/CRDImages/rl/original/DT3063.jpg. P.S. I have changed the contrast of the original photo. Materials: oil on canvas. Dimensions: 102 x 174.5 cm. Sold by Christie’s (New York). Sale 2415/lot 43 (Jan. 26, 2011). Source: http://www.theepochtimes.com/n2/images/stories/large/2011/01/12/lot43.jpg. P.S. I have changed the contrast and the colors of the original photo.